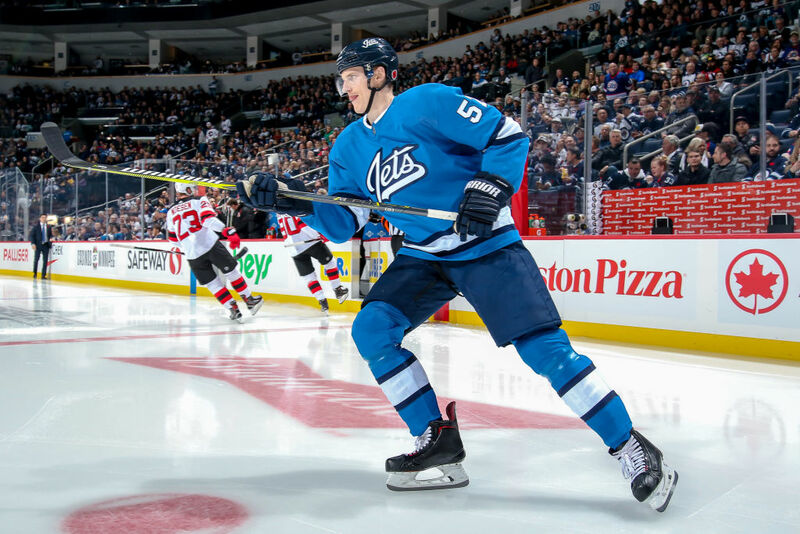 Lousy start, worse luck make Tyler Myers' play look worse than it is - The Point Data-driven hockey storytelling that gets right to the point. With just three points in his first 19 games played, Tyler Myers has been having a disappointing season, especially compared to last year’s 36 point campaign where his play helped solidify the Jets’ defensive core with Jacob Trouba, Ben Chiarot, Dmitri Kulikov and Tobias Enstrom all missing time. Point production isn’t usually something I lean on to evaluate defencemen unless they’re the kinds of players who are expected to create offence, but the perception about Myers this season is more than just about lack of points, the eye test says he’s been struggling in a big way. As someone who is always trying to quantify what players do on the ice, I always try to check my perceptions against data to see if I’m missing something with a player, and as I’ve written before; Myers has some nice qualities as a defenceman and some glaring weaknesses, which can lead to lots of frustration when you’re watching him, especially when he’s an important piece for the Jets. Myers has typically in his career been very defensively porous, both in allowing passes into the slot, and chances from the inner slot or high danger area. He has struggled to use his big, lanky frame to successfully defend lanes in the defensive zone, so the best place to start with him would be on-ice statistics. 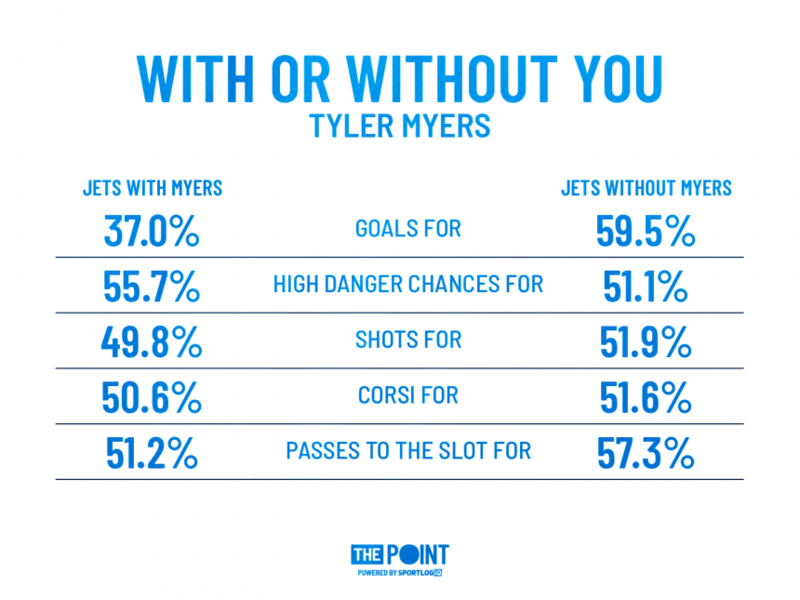 When Myers is on the ice, are the Jets’ outplaying their opposition? Looking at how the Jets are performing with Myers on the ice compared to when he’s not, you can see that despite Myers having the best high danger scoring chance differential of any defenceman on the Jets’ roster, including the fewest allowed per minute played, he’s been lagging behind in shots overall, and is quite far back in passes to the slot. Most defensemen don’t have a huge influence on how many passes to the slot their team creates offensively, but they have an enormous impact on how many their team allows. Unfortunately for Myers, this is an area where the Jets’ forward group have been quite productive while he’s on the ice, but he’s been very porous defensively, with only Joe Morrow being on the ice for more successful passes to the slot against than Myers. Even with that defensive issue though, note that there is no area in actual on-ice play where Myers strays noticeably below 50 per cent, meaning he’s been an even up player, or at least the Jets haven’t been caved in completely while he’s on the ice, and yet in terms of goals, it’s been a horror show, with the Jets being outscored 17-10 at 5-vs-5 while Myers is skating. We know that in terms of shot location that the Jets haven’t been giving up much ground while Myers is on, and because of that it should be no surprise that Corsica.Hockey has Myers with an expected positive goal differential based on the shots he’s on the ice for based on their model. Obviously, that model can’t factor in pre-shot movement, but as we mentioned, while being worse than team average, Myers is close to even there. Part of the problem Myers has had this season is just plain bad luck, with the Jets scoring on just 6.45 percent of their shots while he’s on the ice, which isn’t nearly as bad as the 88.74 percent save percentage he’s had behind him. Pre-shot movement is a huge factor in expected save percentage for goaltenders, but the Jets’ goaltenders have saved a whopping 95.06 percent of the shots they’ve faced at 5-vs-5 when Myers isn’t on the ice, and I don’t think Myers has been so porous that Hellebuyck and Brossoit should see a 6.33 percentage point drop due to one player, that really doesn’t happen in the NHL. This means Myers is playing even hockey despite looking off, and while Myers plays against the lowest level of competition of any regular Jets defender, so not including Morrow and Kulikov who are fighting for the sixth defenseman spot, he also faces that competition with the lowest quality of teammates of any Jets defender when you balance out the Corsi-based and time on ice-based competition and teammate metrics from Corsica. So what are people to make of Myers, playing a third pairing role without much roster help, against weak competition, floating evenly but not dominating, and abysmally unlucky through the first quarter of the season? The trouble with Myers is that he runs so hot and cold, with tantalizing talent but glaring flaws. Any time Myers is really getting grief; he’s probably getting too much grief. Any time Myers is getting heaps of praise; he’s probably getting too much praise. His play is fairly consistently decent despite wild variability in results. It makes him a frustrating player both to watch and evaluate.